October 2008 people from the government, the company and the contractor came to the village Kudubi Padavu. 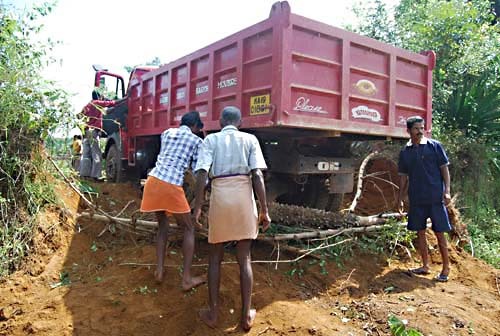 They wanted to dump mud on the farmers' fields. Directly the villagers started to block the trucks. ... activists from Mangalore and relegious leaders. For some villagers the emotions are too much. 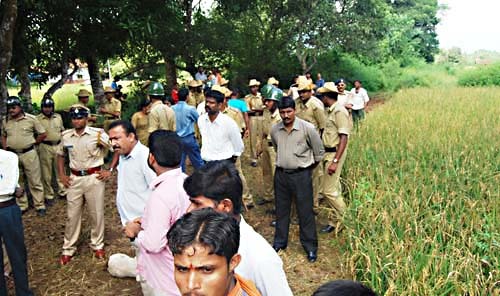 Many police officers are there, but they don't help the villagers against the invaders. 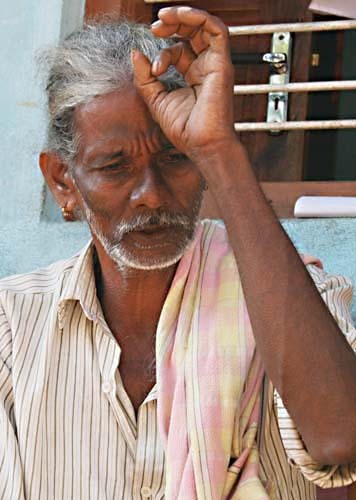 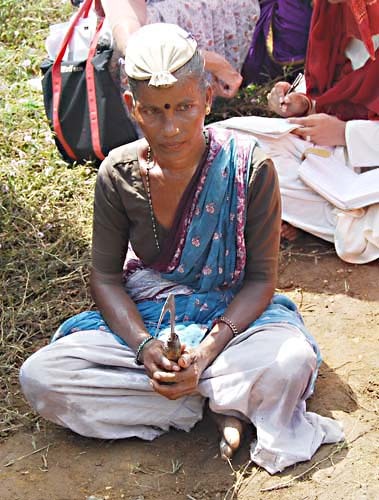 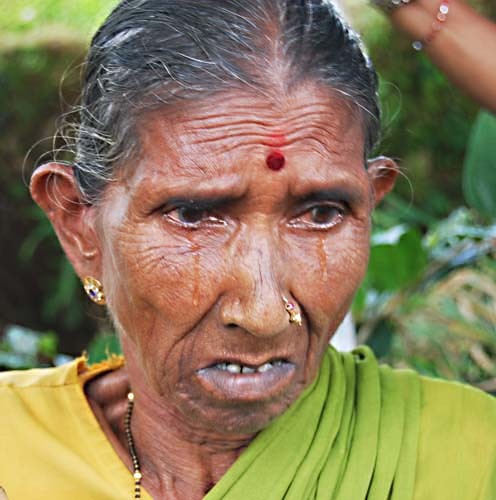 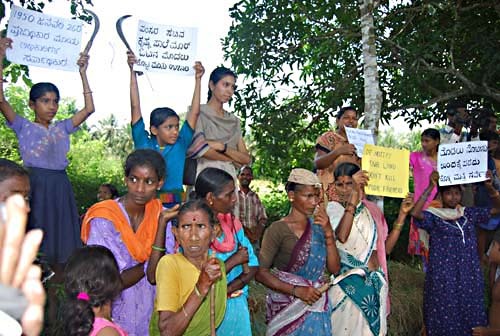 They wait for an opportunity to make false cases against the villagers and activists. 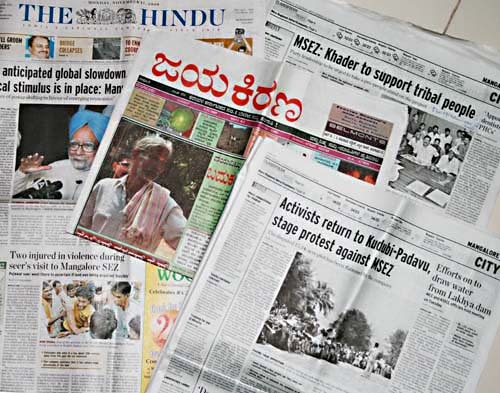 There was a lot of media attention. One year later tribal leader Malapa told about this confrontation, still with a lot of energy. 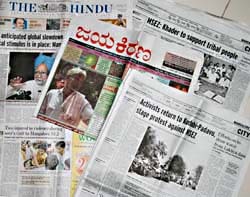 "BAJPE, November 7, 2008. 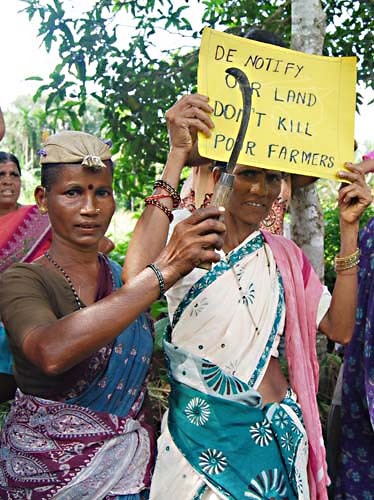 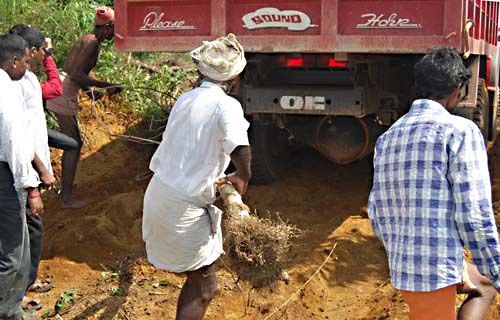 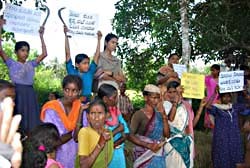 As an implication of the act of MSEZ of filling agricultural land with soil recently compelled the villagers and various organisations to stage a protest on Thursday at Kudubi Padavu. The protest attracted over 500 people who came together and cursed the MSEZ officials for their inhuman behaviour of destroying the crops. 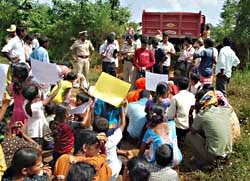 (..) The protesters demanded that a fact finding committee must be placed to find the truth behind the incident that took place at Permude Padavu, the mud that has been dumped on the lands of those who have not received compensation must be removed and no works should be taken up in the region till judicial enquiry of the incident is taken up. 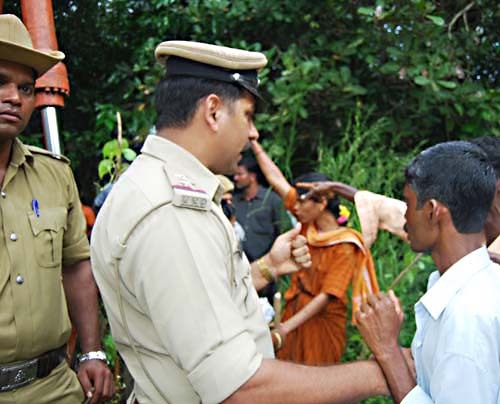 Security was beefed up in the region where the protest was staged. (..) Ironically, the police were performing their duty under scorching sun as the MSEZ had cut off all the trees in the region." 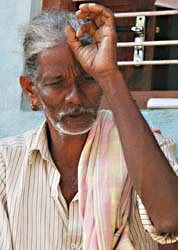 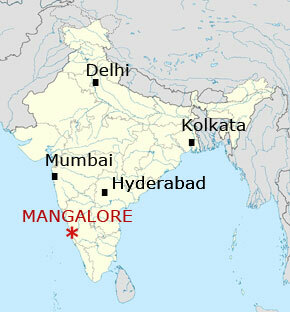 "MANGALORE, January 21, 2009. 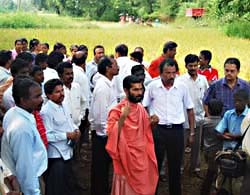 After a prolonged lull in the agitations against the proposed Mangalore Special Economic Zone (MSEZ) project, a group over 300 people reportedly turned against a team of land surveyors in the Thenka Ekkaru village. 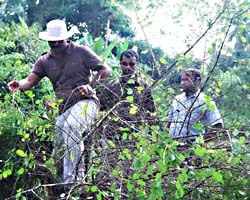 According to eye witnesses, a large group of people gathered minutes after the survey team reached the village. 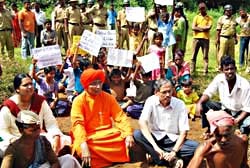 A heated exchange ensued between the officials and the people there and in the end the officials had to retreat, they said. The survey was to be conducted in a 124-acre farmland earmarked for the Phase-II of the project. 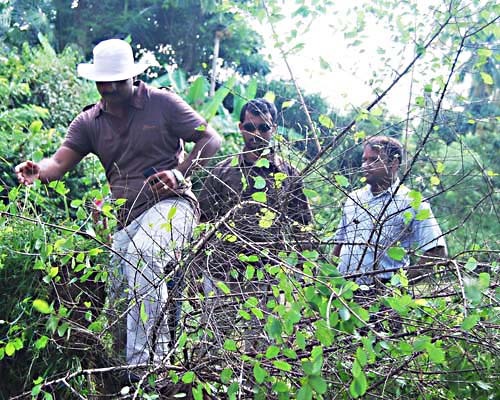 (..) The 124-acre plot in Thenka Ekkaru village belongs to a family of 78 people. 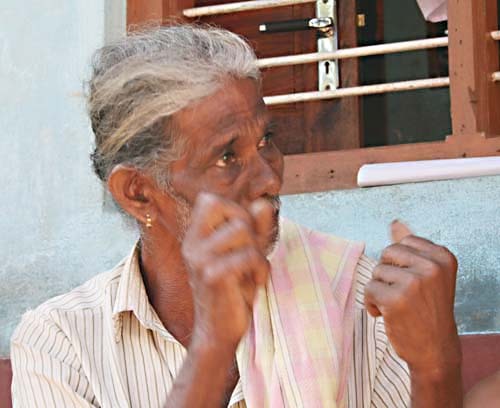 Another 60 families in the village depend on the farmland for livelihood."